On November 28, 1925 at 8 p.m., George D. Hay, who dubbed himself “The Solemn Old Judge”, and an 80-year-old fiddler named “Uncle” Jimmy Thompson launched the inaugural broadcast of the Grand Ole Opry, the longest continuously running radio program in history. As you might have guessed from the date, the Grand Ole Opry is almost as old as commercial radio itself. It began as the WSM Barn Dance, broadcast from a radio station that the National Life and Accident Insurance Company built in Nashville, Tennessee as a public service to the community (and as a way to sell insurance of course – the “WSM” stands for “We Shield Millions”). The name stuck, and the crowds showing up to watch the Opry live grew so large that National Life invested in a studio that could hold 500 fans. But that quickly proved inadequate, and during the 1930s, the Opry moved from theater to theater as the show’s popularity skyrocketed. 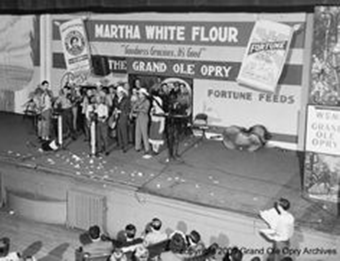 Finally, in 1943, the Grand Ole Opry found a home at the Ryman Theater, where it remained for the next three decades during its golden age. Musical history was made over and over again on the Ryman stage. Hank Williams performed “Lovesick Blues” at the Opry when he was 25, and broke a house record by being called back for six encores. Johnny Cash first set eyes on his future wife June Carter backstage at the Ryman Theater. He told her they would be married someday. It took 12 years, but he was true to his word. A young Elvis performed there in 1954. Patsy Cline sang her signature song “Crazy”, written by an up-and-coming tunesmith named Willie Nelson, on the Ryman stage before her tragic death. The Coal Miner’s Daughter, Loretta Lynn, was thrilled to sing at the Opry early in her career. Being on the Opry meant you had made it the world of country music. In March of 1974, The Grande Ole Opry switched venues to a new $15 million theater in Opryland, USA, a far cry from its barn dance beginnings.